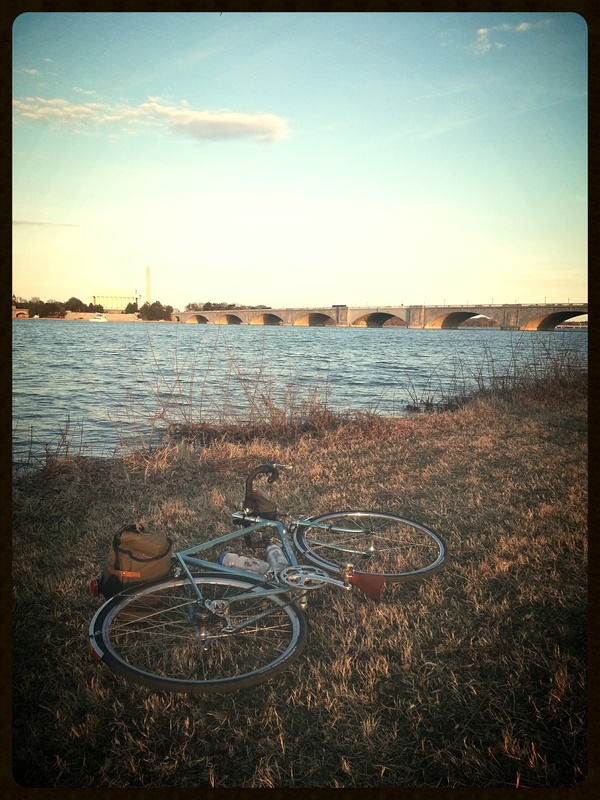 Felkerino and I decided to go on a post-200K brevet joy ride today to bask in the recently arrived warm weather and pay a visit to family out in Northern Virginia. Because of all the stop-and-go movement of the urban environment, we left the tandem in the Dining Room Bike Shop and opted for single bikes on our 50-mile outing. Felkerino rode his Rivendell Bleriot, and I chose my Rivendell Romulus. 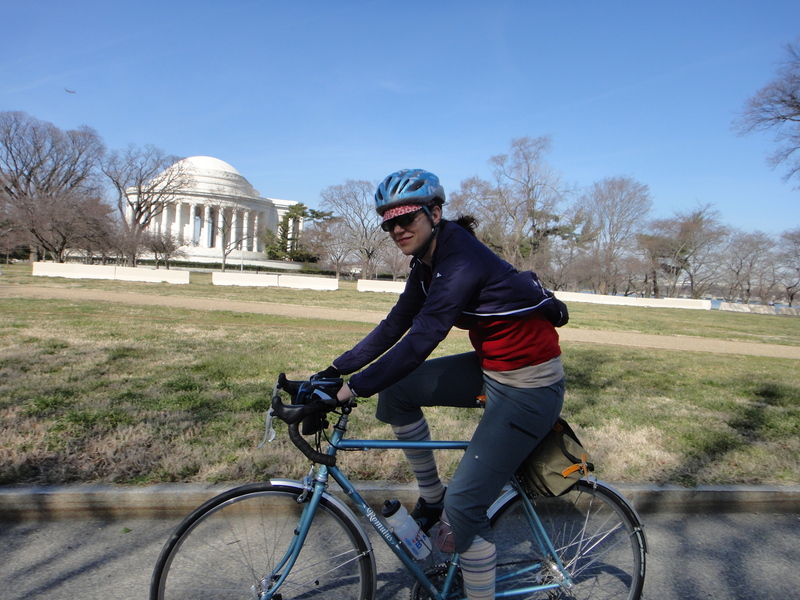 The recently-arrived spring weather made for beautiful riding. Bright sunshine and warm temperatures– how could anyone resist? I think most of D.C. was out enjoying the day. 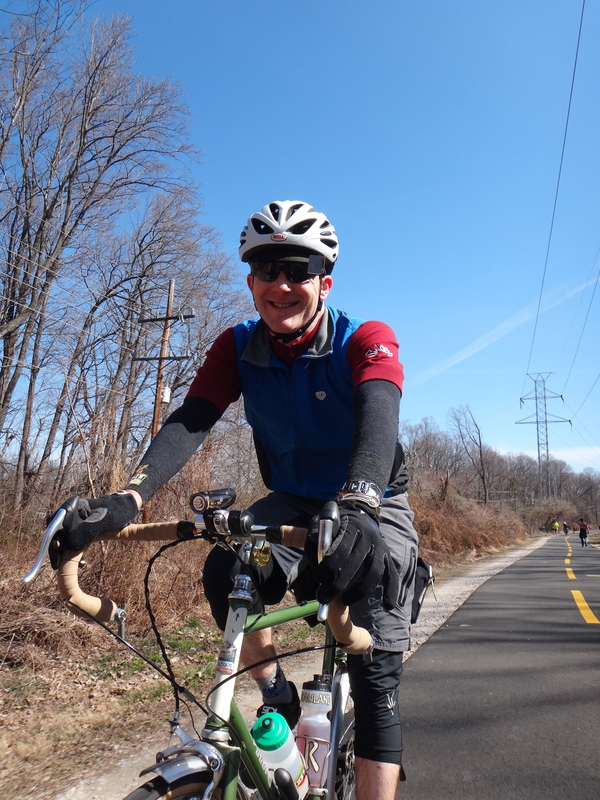 The Custis and W&OD Trails were heavily trafficked with runners, recreational cyclists, sport cyclists, children on training wheels, and walkers. Even with all the congestion, we had a great day. Yesterday’s brevet had sucked most of the pop out of my legs so I rode at a slow but steady pace. 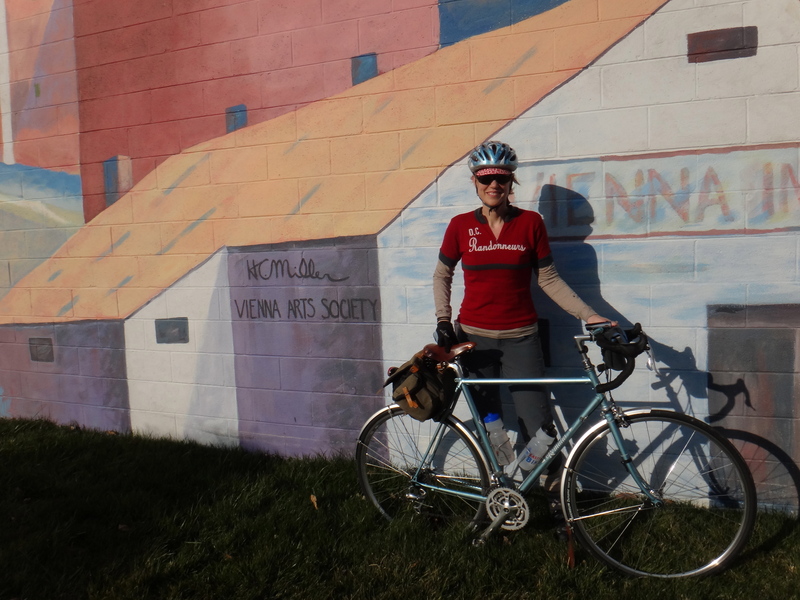 The Rivendell Romulus is the first “brevet bike” I ever purchased, and the most money I had ever spent on a bicycle. At the time, I was not sure what I was doing or if my investment would pay off, but Felkerino encouraged me to make the purchase. Thousands of miles later I still take great pleasure in riding (and taking pictures of) this bike. During our outing, I found myself reminiscing about a Sunday drive in Iowa from many years ago. Myrle, one of the retired farmers in our area, had a vintage 1960s cherry red Ford Thunderbird and he had invited his granddaughter and me to go out on a Sunday drive with him. We meandered over county highways enjoying the sheer experience of being in the car. Corn fields passed by as country music played on the AM radio. As we drove I remember inspecting the carefully designed details of the dashboard. The white upholstered seats were large and luxurious (at least in my memory). The Thunderbird felt grand and awesome, and I felt totally cool to be getting a ride in it. It’s the only time I’ve been in a car like that and one of the rare occasions where I’ve gone for a drive just to go for a drive and watch the corn grow. Today’s ride on the Romulus evoked a similar sensation, only better in so many ways. Instead of watching the world go by in front of the windshield while encased in a vehicle, I was immersed in the elements with my bike. I reveled in the feel of my hands on the bars; they felt so well-placed, aligned just right with my shoulders. The reach from the saddle to the bars allows an optimal stretch for my back. I feel like the bike was made for my body. It rides smoothly as I pedal over the pavement. The handling and responsiveness of the Romulus is lively. Perhaps this is relative to my Surly Long Haul Trucker, a bike I also love, but that has a heavier feel overall. I push the pedals of the Romulus and we’re off. It happily responds to any instructions I give it. The Campy Ergo shifters are a fun change, making for easy adjustments during a standing climb, although for long rides I am still a fan of bar ends. The leather mud flap on the front fender adds a refined look to the bike. I suppose the lugs do, too, but frankly I am not a huge lugs person. Give me a clean weld and I am equally happy. When I initially purchased the bike, I felt the light blue of the bike was too pearly and flashy. Over time, I’ve grown to love it and can’t imagine ever tiring of its bright hue. 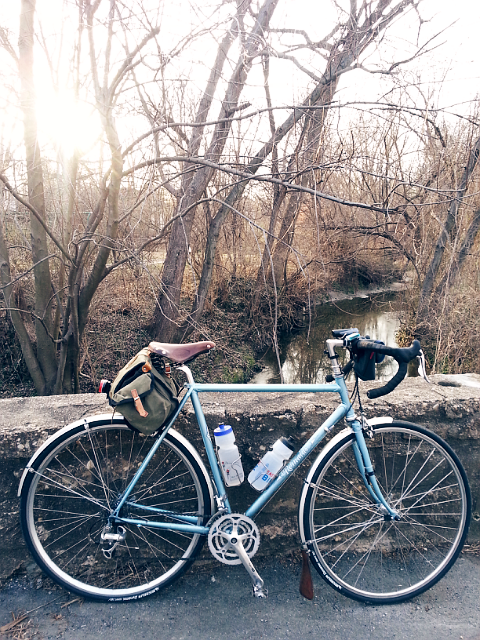 The Rivendell is a beautiful steed and it was wonderful to take it out for a leisurely sun-filled Sunday joy ride. I didn’t have any country music playing in the background, but the chirping birds and the sound of the spring peepers more than made up for that. And Felkerino’s company wasn’t bad, either. Looked at your brevet pix. They’re inspiring; and I’m planning on my first populaire later this year. I’m wondering if you could steer me towards a good cue sheet/map holder? Just know I have moustache bars…….. thanks. Lovely photos and sounds like you two had a near-perfect day on the bikes. I’m very happy Spring is coming. More biking for me! Pingback: New Bike Day! Rawland Nordavinden | chasing mailboxes d.c.